RAWR!!! Now that I got your attention, it’s time for another SUO challenge! This time our theme is designer paper! Don’t you just LOVE dsp? I know that I do and the new Schoolhouse dsp is just DELIGHTFUL! It is especially GREAT when making a fun ‘kid’ card! 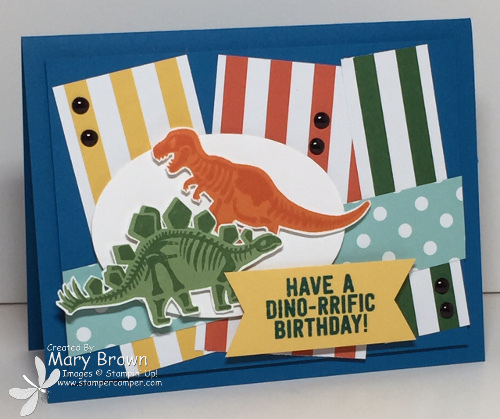 And when you pair it up with the new dinosaur set…how FUN is that! Bold Stripes (Schoolhouse dsp) – cut a piece 3 1/2 wide then cut out the segment with the yellow stripes, tangerine stripes and green stripes. Add these at an angle to the paper. Pool Party dotted (Schoolhouse dsp) – 1 x 6 – lay it on an angle on the panel, trim sides then add panel to the card front using dimensionals. Stamp one dinosaur using Pumpkin Pie and Tangerine Tango and the other using Wild Wasabi and Garden Green, cut out and add to oval using dimensionals. Daffodil Delight – 1 x 2 3/4, stamp greeting using Pacific Point, cut both ends into a banner and add to the card front using dimensionals. Don’t forget to check out what the rest of the design team to see which one they picked! This entry was posted in SUO Challenge and tagged No Bones About It. Bookmark the permalink. love, love, love this. my favorite new stamp set. just can’t get enough of it.